This privileged location joins the remarkable beauty of the landscape and the interesting historical record of being the first site occupied by the Spaniards conquerors in the Rio de la Plata. Sebastian Cabot built in today’s ranch location, on February 15, 1527 a small fortress which was abandoned shortly after. Twenty-eight years later, Juan Romero, commanded by Irala, opened the foundations of the city of San Juan that a few years later were destroyed by the fierce Charrua Indians. 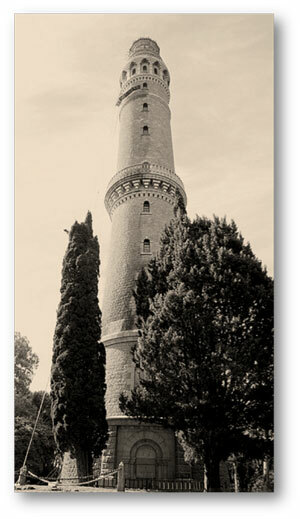 The stone tower/lighthouse (235ft tall) that Aaron de Anchorena built there and from which you can see at a glance the city of Buenos Aires, commemorates those two Spanish foundations and the small museum is housed in the tower itself. In that museum rest the remains and objects recovered from the excavations at the site. "After the initial astonish that causes this park, his overwhelming vocation to greatness, every day, in every step and every detail, you share with that same Aaron de Anchorena who arrived here by chance and built here this rural paradise." “At its base I had built a tomb, where I want my remains to be deposited and rest here in this site so rich in memories for me and for this land that has been so generous in emotions which I have embraced as my own country ... "